Learning doesn't just happen in the classroom—it happens everywhere. The connected learning model supports this principle, asserting that young people learn best when their experiences are interest-driven, peer-supported, and rooted in solid academics. Libraries are the perfect environment for this type of learning, providing a place where teens can connect with each other and with adult mentors to engage and thrive. In this one hour webinar you'll learn how you can cultivate connected learning in your library. Discover more about what the approach involves, its benefits, and what it looks like in various library settings. Also learn how to generate support within your library, re-imagine your spaces and programs to better support learning, integrate technology into programs and services and make it accessible to youth, build partnerships with other libraries (school and public) as well as other organizations, recruit volunteers, and raise community awareness to build involvement. 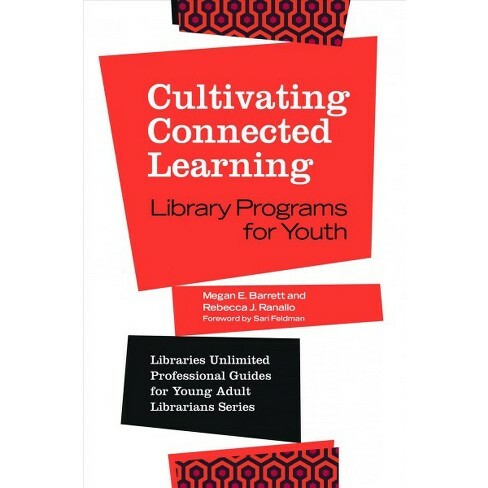 If you're interested in purchasing Megan and Rebecca's book, Libraries Unlimited is offering a 20% discount through the end of October. Megan Barrett is the Information & Technology Literacy Specialist for the Cuyahoga County Public Library where she works with staff to create impactful technology programs for customers of all ages. Equal parts strategic thinker, facilitator, and coach, Megan reframes staff thinking around technology to focus on the learning experience instead of the equipment. A former teen librarian, Megan is a youth advocate committed to creating opportunities to engage and empower teens. Megan has a Masters in Library and Information Science. Rebecca Ranallo is the Information & Technology Literacy Manager for the Cuyahoga County Public Library where she oversees the development and implementation of innovative programming and technology training. Technology in libraries is a constantly changing environment and Rebecca works to help staff embrace challenges and recognize the value of integrating technology into their day-to-day service. Rebecca has a Masters in Library and Information Science and a background in adult technology instruction. Before joining Cuyahoga County Public Library, Rebecca worked for Cuyahoga Community College where she managed their Technology & Information Literacy Learning Program and designed, evaluated and implemented distance learning instruction.